Note: “I&IC OwnCloud Core Processing Library” (working title) is part of a home cloud kit, which was described in a previous post and that will be composed by four various artifacts, both physical and digital. One processing project with one cloud, while the server (OwnCloud) can still be accessed by a regular interface (OwnCloud client). 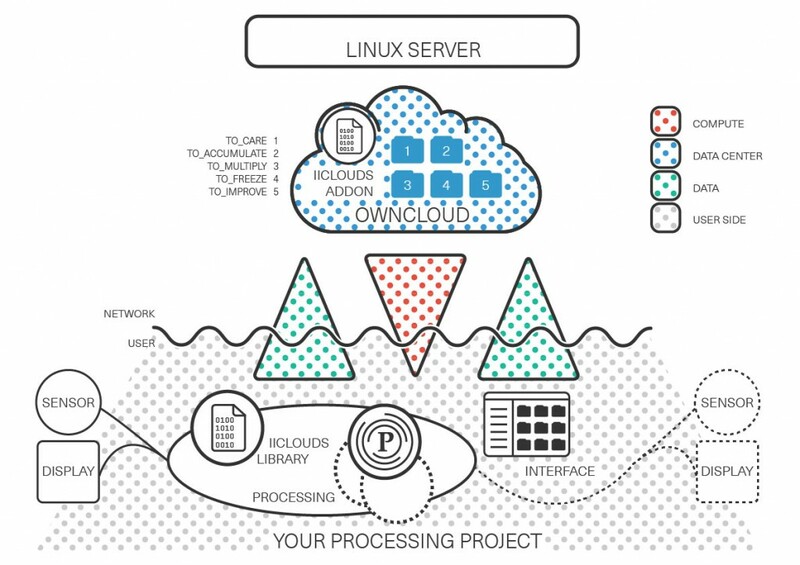 The upper part (white) is the “network/server side” of the project (OwnCloud), hosted on a Linux server, while the bottom (grey dots) is user or “client side”. It can consists in connected objects or environments, interfaces, visualizations of different sorts. The I&IC’s Owncloud Core Processing Library is now composed of a “client side” component and “server side” component (IICloud’s Addon). The “client side” part of the library (“user side” vs. “network/server side” in the illustrations above and below) can be used from Processing, in order to get access to OwnCloud server(s) and manipulate files. The benefit of the core library resides in the fact that it mashups all together a set of heterogeneous functionalities in one single library (it has been therefore renamed I&IC OwnCloud Core Processing Library as it is more closely related to our research).